Interested in learning how to pilot drones and to put the invaluable tool to work in your industry? We’re excited to offer our new Drone Class that offers two drone piloting options, ideal for beginners or aspiring professionals. Safety and efficiency are paramount to modern energy refining facilities and inspections are mission critical to maintaining operations. Traditional inspection methods have always been challenging as facilities can cover large areas with complex structural layouts. UAVs allow for even the largest facilities to be inspected quickly from the air. TWO-DAY COURSE: Our two-day course prepares students for the FAA Part 107 Exam for commercial drone operators, and provides introductory training to DJI Phantom 4 piloting. 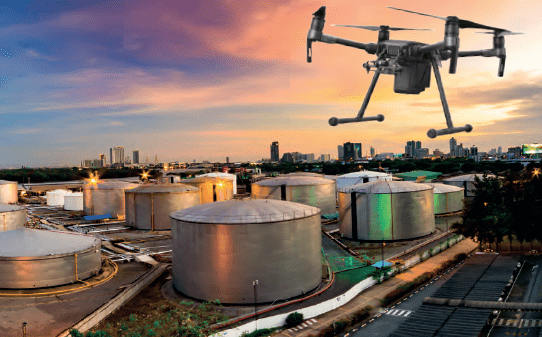 FIVE-DAY COURSE: Our five-day course includes all instruction from our two-day course, and then also explores the complexities involved in advanced commercial drone operation for use in industrial environment inspection. For more information about the course, contact Jason Acerbi at jacerbi@mferentals.com.